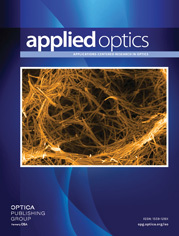 The authors are with the Department of Physics, the Institute for Ultrafast Spectroscopy and Lasers, New York State Center of Advanced Technology for Ultrafast Photonic Materials and Applications, City College of New York, 136th Street Convent Avenue J419, New York, New York 10031. A new approach for optical imaging and localization of objects in turbid media that makes use of the independent component analysis (ICA) from information theory is demonstrated. Experimental arrangement realizes a multisource illumination of a turbid medium with embedded objects and a multidetector acquisition of transmitted light on the medium boundary. The resulting spatial diversity and multiple angular observations provide robust data for three-dimensional localization and characterization of absorbing and scattering inhomogeneities embedded in a turbid medium. ICA of the perturbations in the spatial intensity distribution on the medium boundary sorts out the embedded objects, and their locations are obtained from Green’s function analysis based on any appropriate light propagation model. Imaging experiments were carried out on two highly scattering samples of thickness approximately 50 times the transport mean-free path of the respective medium. One turbid medium had two embedded absorptive objects, and the other had four scattering objects. An independent component separation of the signal, in conjunction with diffusive photon migration theory, was used to locate the embedded inhomogeneities. In both cases, improved lateral and axial localizations of the objects over the result obtained by use of common photon migration reconstruction algorithms were achieved. The approach is applicable to different medium geometries, can be used with any suitable photon propagation model, and is amenable to near-real-time imaging applications. a Target strength is the ratio of the scattering coefficients of the target to that of the surrounding medium. The errors in location are not greater than 3 mm.